Jaipur : Holani Consultants Pvt Ltd that was into providing financial consultancy for last 17 years today has entered into Merchant Banking sector. The company is important financial consultant group that provides finance and financial consultation to the entrepreneurs under one roof, which proves very helpful for getting any company established in the market. 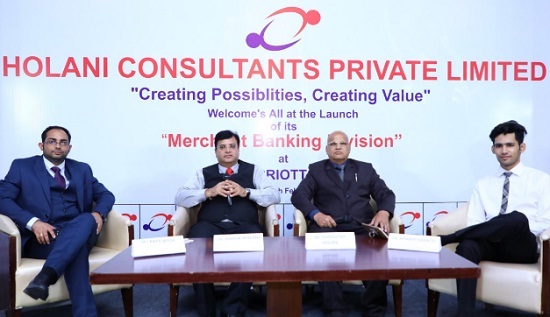 On this Occasion Company’s director Ashok Holani said that, "The company is an expert in merchant banking and financial consultancy services like SME IPO, Mainboard IPO, company valuation, merger and acquisition and undertaking works. The company provides various kinds of services in project management specialties in which mainly public issue (IPO) and work as manager consultant." Holani Consultants Pvt Ltd is working under the leadership of Ramavtar Holani. He is financial consultant for last 40 years and has a long experience in the field of financing enterprises. A team of young, energetic and professional is working under his leadership and the team includes chartered accountants, company secretaries and MBA etc. The founder of this institution Ahok Holani is fellow member of Institute of Chartered Accountants of India and is a practising CA for last 17 years. He has deep experience of corporate consultancy, auditing, corporate law, debt syndication and IPO. The other members of this team are CA Bharat Mantri, MBA Kapil Bissa CA Gaurav Kumar, CS Rashika Khandal, CS Sarla Baghel, Pallav Falod and Deepak Jangid.